Ninety percent of all people with AMD have this type. Scientists are still not sure what causes dry AMD. Studies suggest that an area of the retina becomes diseased, leading to the slow breakdown of the light-sensing cells in the macula and a gradual loss of central vision. Although only 10 percent of all people with AMD have this type, it accounts for 90 percent of all blindness from the disease. 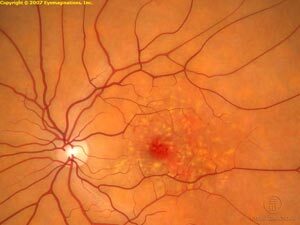 As dry AMD worsens, new blood vessels may begin to grow and cause “wet” AMD. Because these new blood vessels tend to be very fragile, they will often leak blood and fluid under the macula. This causes rapid damage to the macula that can lead to the loss of central vision in a short period of time. Women tend to be at greater risk for AMD than men. Whites are much more likely to lose vision from AMD than Blacks. Smoking may increase the risk of AMD. Those with immediate family members who have AMD are at a higher risk of developing the disease. Both dry and wet AMD cause no pain. The most common early sign of dry AMD is blurred vision. As fewer cells in the macula are able to function, people will see details less clearly in front of them, such as faces or words in a book. Often this blurred vision will go away in brighter light. If the loss of these light-sensing cells becomes great, people may see a small, but growing,blind spot in the middle of their field of vision. The classic early symptom of wet AMD is that straight lines appear crooked. This results when fluid from the leaking blood vessels gathers and lifts the macula, distorting vision. 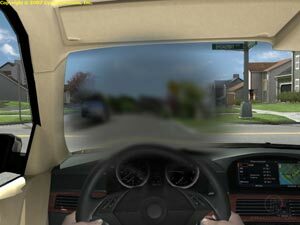 A small blind spot may also appear in wet AMD, resulting in loss of one’s central vision. 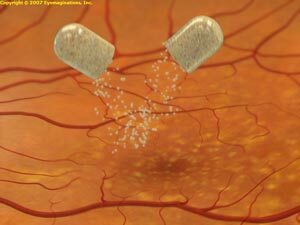 No treatment now exists for dry AMD. It has been suggested that taking certain extra vitamins and minerals may slow the progress of the disease. But this treatment needs much more research before scientists can know for sure if it’s helpful. Eye care professionals can treat some cases of wet AMD with laser surgery. This treatment involves aiming a strong light beam onto the new blood vessels to destroy them. Laser surgery is done in a doctor’s office or in an eye clinic and lasts a short period of time. Although a person may go home the same day, he or she will need to return for follow-up exams. To learn more about AMD, write: National Eye Health Education Program, 2020 Vision Place, Bethesda, MD 20892-3655. Source: National Eye Institute, National Institutes of Health.